This is one of the ties shown in the creative ideas section. 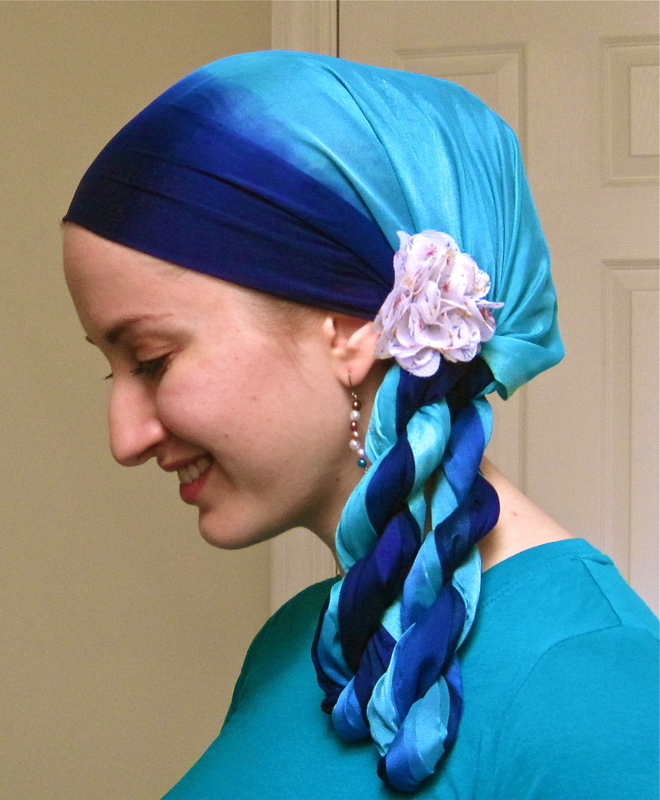 To do it, you’ll need a long rectangular scarf (the longer the scarf, the longer the twists). If you would like your twists to be even, then tie the scarf with both ends the same length. If you would like them to be uneven, make the ends uneven! In the photo above, I made the ends slightly uneven so when they’re pushed to the side, the look almost the same. Feel free to do it with or without the sash shown in the video… and happy twisting! I’m so glad that we’ve connected! Thank you so much for your encouragement… Bz”H we will get to meet in person one day! This means so much coming from you, because you were one of my tichel inspirations when I was living in Toronto. THANK YOU!! Ohhhh I have got to try this one… one on each side like pigtails maybe! Just lovely! I am not Jewish. I am Messianic. I used to wear head wraps but stopped due to criticism from my mother over the years. Now I am 30 and I feel so far from who I really am. So with the consent of my husband, I started wrapping my hair again. But thanks to your videos, my hair is wrapped with beauty rather than a simple scarf. Thank you! Hi Carrie, I am so glad to hear that you are once again being true to yourself and wrapping your hair beautifully! It’s so hard to do that which you know is right when the world around you tells you the opposite. I admire your bravery and am glad that it is making you so happy.